New "Quick-Cool" function cools down the rotor to 4oC in 8 min. 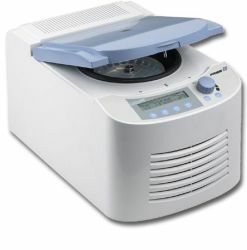 The new Prism R is quickly becoming the benchmark in the refrigerated microcentrifuge category. In spite of its remarkably small footprint, the Prism R has a powerful brushless motor and cooling capacity to spare. The new user-friendly LCD control panel i provides intuitive control over all operating parameters , including speed, time and temperature. Speed can be set in rpm, up to 13 500 rpm in increments of 100 rpm. or rcf, up to 17 135 x g in increments of 100xg. Operation of the centrifuge can be timed, from 0,5 to 99 minutes, or continous . A momentary spin function is activated by pressing and holding the quick key. The powerful refrigeration system maintains temperatures as low as -10oC and is designed to reach 4oC (from room temperature) in less than 8 minutes. The brushless motor drive quickly and effortlessly accelerates the rotor to set speed. A computer designed isolation system ensures vibration free operation , even with an slight imbalance. The Prism R is also equiped with an imbalance detection system that automatically shuts down operation in the event of a significant imbalance. Deceleration at the end of a run is attained in less than 18 seconds, yet will not disrupt samples. The unique design of the 24 place rotor allows easy access to the tops of sample tubes. Individual tube slots in the solid aluminum rotor support the tubes along their length hand contain sample in the event of tube failure. The rotor accepts 1,5/2,0 ml tubes directly and smaller tubes though the use of adapters , sold separately. An optional StripSpin adapter snaps on the top of the rotor for spinning 0,2 ml tubes and PCR strips. The rotor is seated on a tapered shaft which facilitates easy removal of the rotor for cleaning and autoclaving.